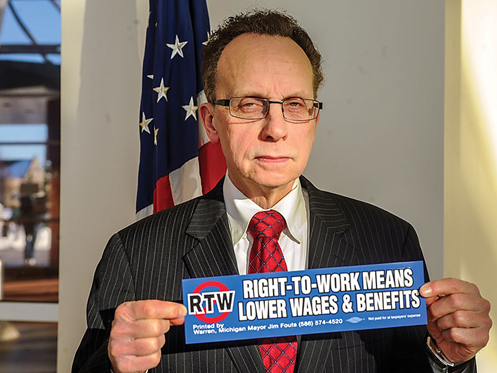 Warren Mayor James Fouts is giving away “Right-to-work means lower wages & benefits” stickers. James R. Fouts, the incumbent Mayor of the City of Warren is the son of a UAW member and fondly recalls his father often crediting union work for the family’s quality of life. Following the passing of the Mayor Jim Fouts stated that the law would ultimately defund unions, which has been critical in protecting the benefits of workers and may lead to a reduced quality of life for Warren residents. Warren is home to several automotive companies including GM and Chrysler. To show his disapproval of the new law which strips collective bargaining power of unions, the Mayor had hundreds of stickers printed which read “Right-to-work means lower wages & benefits.” The stickers, printed by workers represented by a union, and paid for personally by the Mayor, were then given away to Warren residents at City Hall to build awareness in the community. ← Mayor’s office was epicenter for all Flood Relief Aide Efforts in Warren.